TifTuf™ Bermuda grass, the newest bermuda grass cultivar acclaimed for superior drought resistance and minimal water requirements, is now available for purchase from NG Turf. TifTuf™ is the product of more than two decades of research and testing by the turfgrass scientists at the University of Georgia's Tifton campus. TifTuf™ sets the new industry standard for sustainability and drought resistance. It is destined to become a customer favorite for both residential and commercial applications. The turfgrass industry invests a great deal of time and effort researching ways to improve sustainability and reduce water consumption. TifTuf™ Bermudagrass, the newest cultivar acclaimed for superior drought resistance and minimal water requirements, is now available for purchase from NG Turf. TifTuf™, originally bred in 1992 at the University of Georgia’s Tifton campus, was one of more than twenty-seven thousand cultivars studied. Throughout more than two decades of testing, Tiftuf™ proved itself to be the best performing cultivar under drought conditions. Among the 90 cultivars that passed initial drought tolerance testing, TifTuf™ maintained its quality and green color the longest. Further testing included 19 drought stress trials, 2 traffic stress trials, and 4 irrigated non-stress trials at universities across the country. 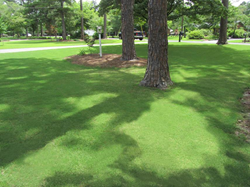 In 2013, TifTuf™ was entered into the National Turfgrass Evaluation Program (bermudagrass trials) where it scored highest in quality ratings in North Carolina, Florida, Mississippi, Tennessee, Texas, Oklahoma, and California, and excellent ratings in Alabama, Georgia, Indiana, Kansas, Kentucky, and Missouri. TifTuf™ has fine, bright green blades and a rapid growth rate, allowing for faster establishment and quicker recovery from injury. It also displays superior insect and disease resistance; grows well in both sun and shade; maintains a healthy appearance even under heavy traffic; and maintains density, color, and vigor while using less water than other varieties. Like all bermudagrasses, TifTuf™ is a warm season turf, going dormant in winter, so TifTuf™ can be harvested and installed year round. The Turfgrass Group, co-owned by Aaron McWhorter and Ken Morrow, is the exclusive licensing company for the production of TifTuf ™ bermudagrass. To learn more about TifTuf™, or any of their ten other proprietary sod varieties, please contact NG Turf at (770) 832-8608 or visit them online at ngturf.com.